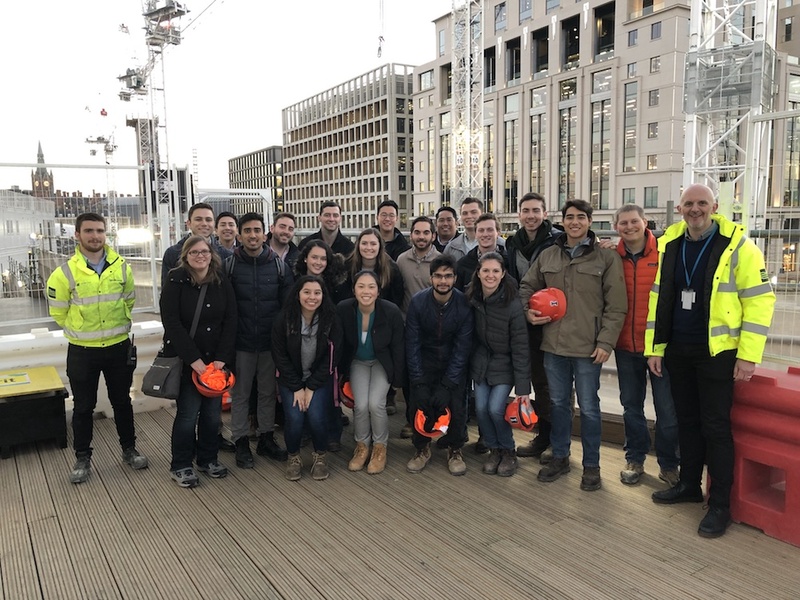 In the afternoon, the Global Leaders had the pleasure of visiting the new 11-story Google London headquarters building at King’s Cross with Lendlease as the main contractor for the project. 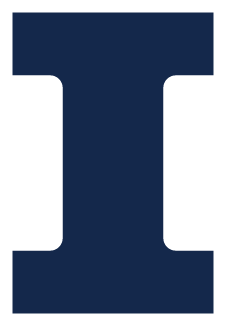 The new building will be 687,000 square feet in Net Internal Area (NIA) and 870,000 square feet in Gross External Area (GEA). It will be the home to more than 4,000 Googlers once completed. The final design was created by the Bjarke Ingels Group (BIG) and Heatherwick Studios which were in charge of the 2012 London Olympic Cauldron. The entire complex will ultimately cost Google £1 billion ($1.3 billion). 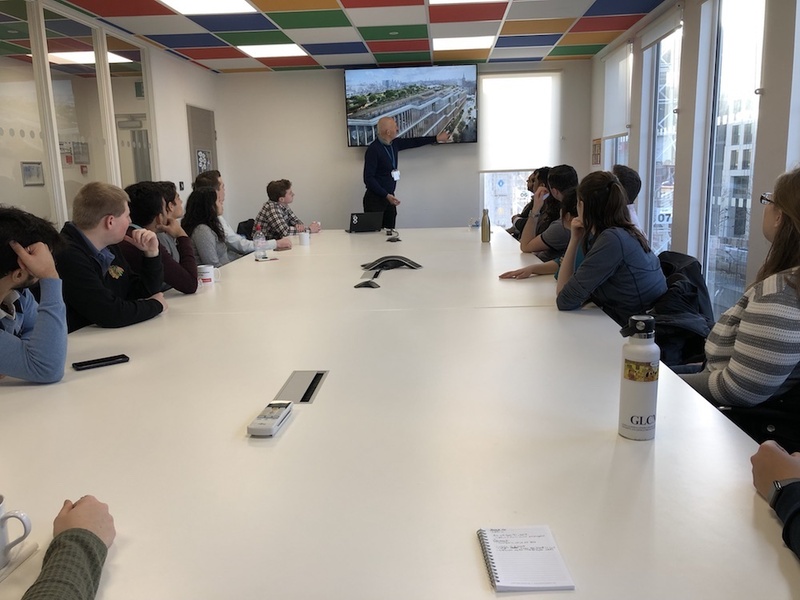 The GLCM team was given a presentation by Jake Mitchell from Lendlease about the overview and logistics of the project. He mentioned the various amenities that will be included on this project. He talked about how the building will contain a rooftop garden with a running track. For the garden, there will be around 250 trees carefully chosen so that they do not drop leaves on the railway lines. This prevents the problem of trains in the winter because they are not able to stop properly if leaves are on the railway. The building will also contain a restaurant, seating areas for outside meetings, and quiet areas for the google employees to work peacefully. In addition, there will be sports facilities such as a basketball court and swimming pool for their workers. An interesting model of the project was shown in a cross section view. 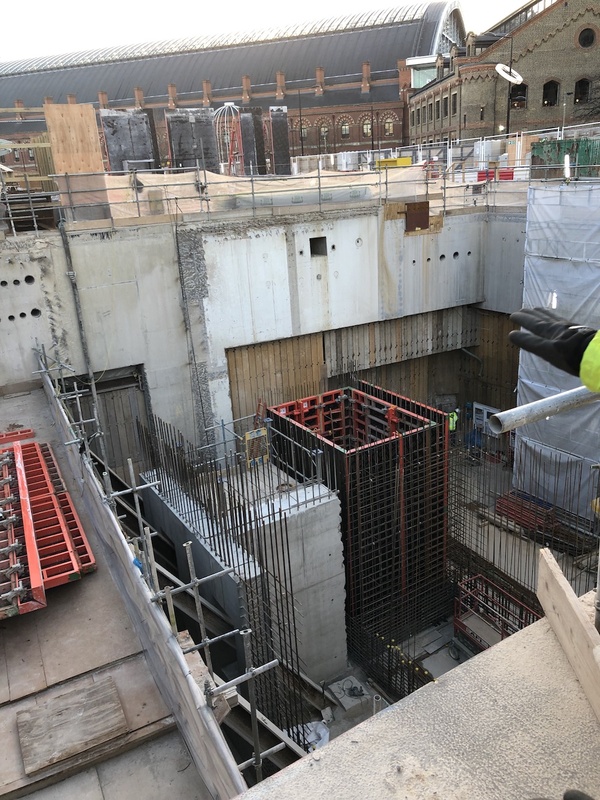 In order to make the retail space as flexible as possible, all the building loads will run through central columns into a big concrete pile foundation. The remainder will be hung from trusses at roof level. The team was then taken on site in order to get a first hand view of the project. The project is broken down into what they call five elevator cores. The first core visited was core two. Lendlease had started to put scaffold platform frames in. It gives the ideal working platform to put up the steel frame that core two will sit on, which will go occur by the end of this month. They have also started to backfill in to lift core two. The next phase for this core is the steel which will starting coming through by the end of March. Once this is complete, they can start sending in the mechanical and electrical service units. These are large units which means they will have to be driven through the basement to start building from the bottom up again in order to maximize the size of units they get in to produce the amount of fabrication that they do on site. 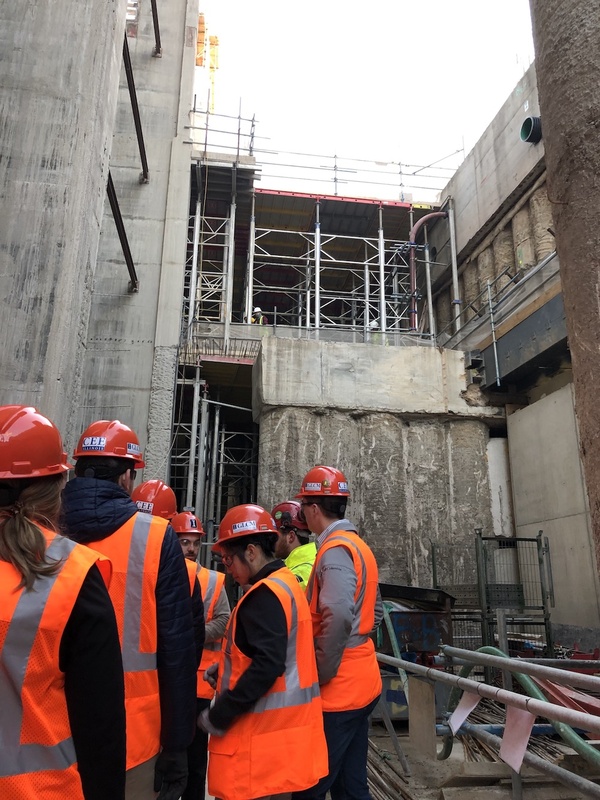 Throughout the project site visit, the team progressed from one core to another. The construction manager explained the process of this core, which was similar to core two. He expressed that core three was more straightforward than core two and that a lot of the challenges faced in the previous cores were able to be avoided in the following ones. A unique aspect of the project was shown to the team at the end of the site visit which was known as the truck turntable. This machine allows the trucks to turn 180 degrees because the project site is not spacious and there is only one street available for the trucks to move. It was prefabricated off-site and brought down on site. A few members from a small company named Bolton came down and built it in four weeks. Luckily, a truck was in the midst of using the turntable and the process of the machine was demonstrated. The GLCM team would like to give a special thank you to Lendlease, especially Project Executive Dennis Wilson, for giving the opportunity to visit the Google Headquarters!